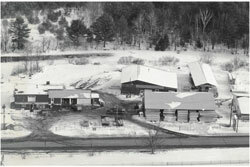 LaValley Building Supply was founded by Harold and Geraldine LaValley in 1962. Today it is a second generation owned business headed by Lawrence Huot. It is the largest independently owned building materials supplier in Vermont and New Hampshire. From the beginning, we have strived to be always the low cost provider of building materials and services. The desire to provide our customers with quality products at prices lower than any of our competitors can sustain, led us into manufacturing many years ago. In 1962 our business was started in Newport, NH, where we manufacture roof trusses, wall panels, door units, kitchen countertops, as well as operate a custom planing mill. In Middleton, NH we operate one of New England’s largest state of the art saw mills along with dry kilns, planing and resaw operations. As a member of the Lumberman’s Merchandising Corporation, we combine our purchasing power with over 300 other independent lumberyards and home centers. With over fifteen billion dollars in combined purchasing power and the additional assets of our own manufacturing of homes, garages, trusses, and lumber (from our own mill, Diprizio Pine Sales in Middleton, NH), we present to our valued customers, top quality merchandise, lumber, building systems, project solutions and more experience often at lower prices than the big national chains. Delivery is free with orders over $100.00.